It is only noon and I have already interacted more with life in a positive manner than usual during this long health crisis. Candy-cane beets brought a surprised smile to my face and walking out into the bitter cold felt like a breath of heaven. It is only noon and I feel like I am on a roll. Choosing to interact more with life and the world is off to a good start. It is the simple things in life that make me so happy that I know I can keep walking through the rest of this healing journey. There have been so many negative barriers that I chose to gently find my way through them as a New Year’s resolution. I am choosing to interact more with life, with the world more. The limitations are immense because of my physical health but it is time to gently break down any negative barriers I can. Food is a huge issue for me. I have not been able to eat much during the last few years. One year, pretty much all I ate was a cup of kitchari (special beans, rice, and spices) once a day. That was all I could choke down and keep down. Had no appetite. Had a 4-inch diameter mass causing problems that I was not aware of until the mass was found. So… food and eating have become major drama. Food is our friend, not the enemy!! As I have worked my way through the last few years with the food issues, I have had to remind myself that we all require food to survive. And when we actually cozy up to food and allow it to be our friend and not our enemy, we interact quite differently with it. At that point, we calm down more when we eat, we relax into our meals, and then we can digest it better and get more nutrients out of it. How much do we interact with the food that we eat? Really, think about it for a moment. Do we choose the easiest quickest way to shove food in, or do we actually have some interaction with our food? My morning drink is highly interactive. There are a few steps to it that keep me involved in creating it just the way I like it and in a manner that is not only tasty but full of the nutrients I need to start the day. I receive delight in this morning ritual because I have chosen to nourish myself in this manner, on a physical and emotional level. Lunch is my largest meal of the day. I shoot for high noon because that is the time of day that our bodies are prepared for the most effective digestion of food. Today I made my usual kitchari for lunch. In the process, I added a beet. Only because I interact with my food, using whole real food, did I have the opportunity for such a surprise. The inside was stiped!!! It was red AND white striped. I have seen pictures but never ran across one myself. Most people with auto-immune diseases react well to cold weather. It actually calms the body, creates better breathing, and can reduce some inflammation. It can take the intensity out of the moment of feeling so physically overwhelmed by auto-immune symptoms that it has a calming effect. I have heard many others talk about this and I have even had some doctors recommend this as a way to test yourself to see if you are dealing with auto-immune symptoms or not. If you walk outside and take in the bitter cold for a few minutes and you feel better, chances are, you are experiencing auto-immune symptoms. Not sure how much science there is behind that one but it is a great free home test. It was 29 degrees this morning when I decided to venture out to the post office. I had just gotten out of the shower so I had wet hair. I had flip-flops on and no coat. Ohhhh my was I happy and more comfortable. Walking to the car, then from the parking lot inside the post office and back again was refreshing and invigorating. It did me a world of good. I even noticed that I was able to interact better with the post office staff because the intensity of my symptoms was temporarily relieved by the cold. My interactions today with food and the cold were so incredibly simple but they did me a world of good. I did not “feel” like doing either, but I knew that making those choices would get me one step farther down the path of healing. The extra treat I received out of the extra effort was a positive short interaction with two human beings at the post office. Usually, that short little trip to the post office physically is overwhelming. With the burst of cold that made me more comfortable I had what it took to interact just a little more and a ton better with others that crossed my path. Success, I love it. 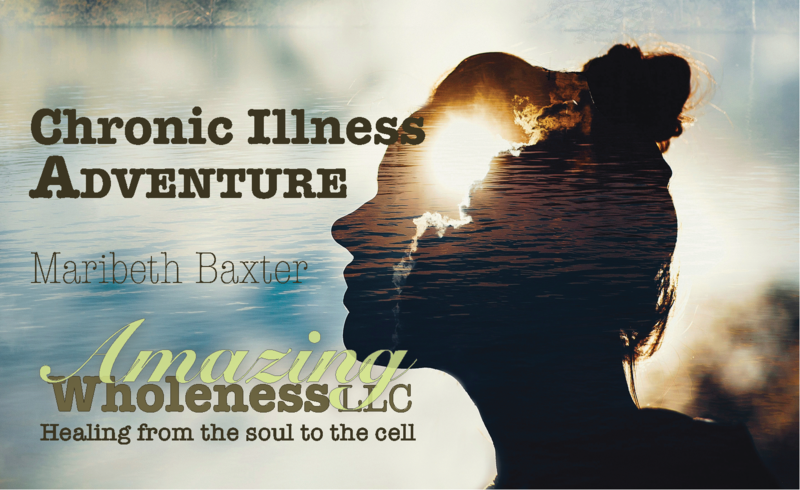 While we are chronically ill the obstacles seem overwhelming. By breaking it down into bite-size interactions, we can find successful movement through chronic illness instead of getting stuck. What have you done today to interact with yourself and the life you have TODAY? Please, please, please nourish yourself through interaction with your current life.